Donna Leon is a generous writer. Anyone who has read any of her seventeen mystery novels to date will know that she gives not one story but three. There is the central plot of crime and intrigue that holds the novel together. But always running alongside this is the enchanting story of the leading detective’s family life. And behind these themes is the ever-haunting presence of the city of Venice itself. Leon has lived there for over 25 years and writes about the beauty, the danger and corruption lurking in the exquisite palazzos, the sense of style, love of food and overall Venetian glamour that really takes you down the canals in the gondolas with her leading characters. 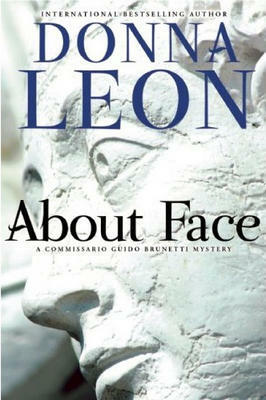 “About Face” has its own story of murder, which comes very close to the family of Guido Brunetti, the detective in charge. It is at a dinner party at the house of his father-in-law, Count Falier, that he meets a woman who turns out to be involved in his investigation into a suspicious death. The violence is dangerous but does not overcloud an excellent detective story. Donna Leon has done it again; it’s a fine read.